Yesterday we were in Cozumel, Mexico! 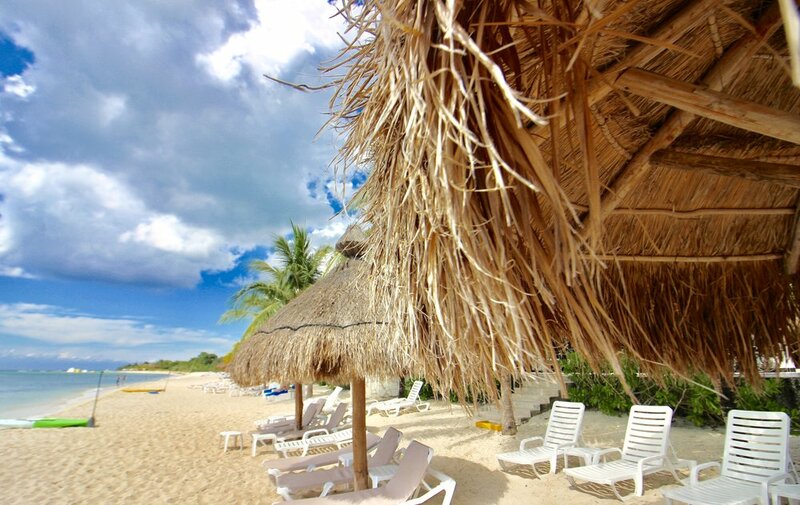 Who doesn't love Cozumel?! I got up at 5:30, just like usual. I know I said this in yesterday's blog, but today's sunrise was unlike any other. As we sailed into Cozumel, I ate breakfast in the Garden Cafe. I only ate two waffles and I was full. Weird, I know. I made up for it at dinner, don't worry. We didn't dock in Cozumel until 10 so I had a lot of time to kill. I took some pictures of the other ships in port: Harmony of the Seas, Carnival Vista, Celebrity Silhouette, Carnival Miracle, and Carnival Fantasy. We got off the ship at around 10:30, and got back on at 10:32. We forgot our towels. We were those people. We ended up having to walk up the stairs from deck 4 to deck 16 because it was impossible to get an elevator. I was winded by deck 5. It was good exercise for us! The concierge must think we are crazy. He brought us down in the priority elevator the first time, and then he had to do it a second time. He gave us a funny look and just kinda went with it. The second time we got off the ship, we got lost. We could not find a way out of Punta Langosta that had a ramp for Emily's wheelchair. We ended up having to go through a mall to find elevators to just walk some more. We only had to wait about 5 minutes to get a taxi. Let me tell you, riding in those small taxis feels like riding in clown cars that are in a race to the finish. For us, the finish was Nachi Cocum Beach Club. This was our third time in Cozumel, and our third time at Nachi Cocum. We love it there. It's a paradise within paradise. You pay about $55 for each person, and that gets you food and drinks all day long, all brought to you while sitting on the gorgeous beach. The food isn't great, but you get what you pay for. We stayed there until around 3:15, until we shoved ourselves into another clown car taxi. When we got back on the ship, I took a nap because I was super tired. It must be from waking up really early and going to bed really late. We had a reservation at Le Bistro for dinner at 6:30. I woke up at 6:23 to find that my family had abandoned me for French food. I threw on some nice shorts and a casual t-shirt and started to head downstairs. When I was in the elevator (that had to stop at every floor on the way down), I got a text from Dan saying, "Wait for me in the room." Before I could ask why, I was on deck 5 and when the doors opened, he was standing there waiting. It turns out he got turned away from Le Bistro because he didn't have pants on. None at all. Haha I gotcha! Well probably not, but we'll just pretend you did. He had shorts on, which apparently was unacceptable. We both had to go back to the room and change. We then went back down and we were accepted into the restaurant for dinner. Dinner was excellent! For appetizers, I had the Escargot and French Onion Soup. I'm not even gonna try to type what the actual names of those are on the menu. For my entrees, I had Peppercorn Beef Tenderloin and Jumbo Shrimp with Artichoke. 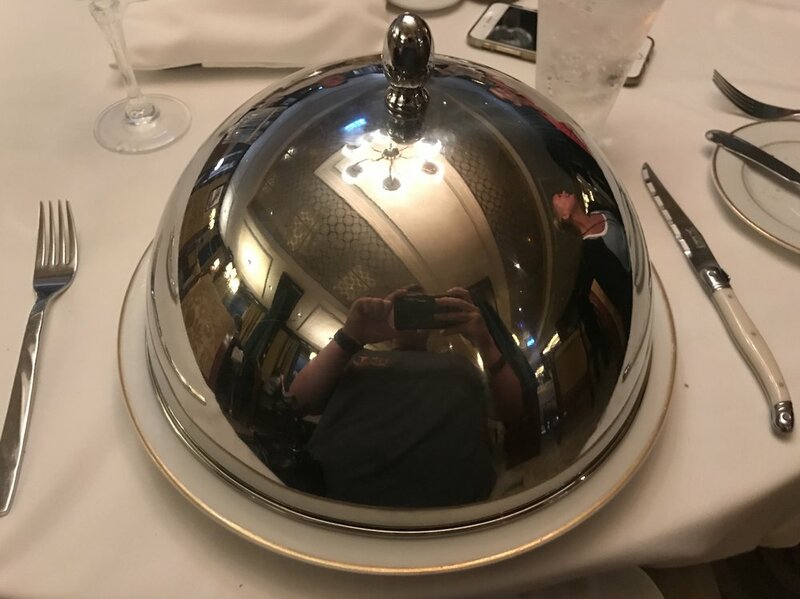 When they bring you the main course, they have a metal cover over all of the food that they dramatically lift off of your plates simultaneously. It was pretty cool. For dessert, I had the Crême Brûlée and the Profiteroles. The Crême Brûlée was the best thing that my taste buds have ever touched. Le Bistro was so good that we might change our reservations for tomorrow night from La Cucina to Le Bistro. After dinner, we went to the casino and did some gambling. We did the DaVinci Code machine, and saved most of the coins to use in the casino today. When we got back to our stateroom, it sounded like there was a rock concert going on next door. This has happened every night, but last night it was even louder. Loud music and people screaming. It was really annoying, especially since Emily was trying to sleep. I made a call and they said they would send somebody up. It got a little bit quieter, but there was still the occasional yell. Today is the last day of our cruise. I like to tell myself that it's not, but it is. It went by really fast. I'll be back tomorrow to tell you all about our last sea day. See you then! If you’ve read this far, comment Shush!